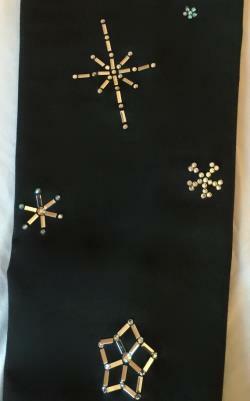 "snowflake- storm" figure skating pants that are made to your measurements. 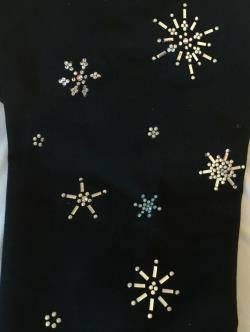 The snowflake legging is made of a high quality 94% cotton/ 6%dex fabric that was created for dance/athletic wear. This fabric is super soft and stretchy. The pants feature a foldover waist band and a long length that can be pulled down over the heel of your skates. The snowflakes are created individually, each stone handset with hot fix preciosa crystal in crystal, crystal ab, aqua ab and silver hot fix baguette rectangles. Measurement chart:petite length 5'2"-5'3"average length for height 5'5"-5'7"tall length for height 5'8"-5'9"xsmall (ladies 4-6) waist 22-23, hips 31 1/2- 32 1/2small (ladies 8-10) waist 24-25, hips 33 1/2-34 1/2medium (ladies 12-14) waist 26 1/2-28, hips 36-38large (ladies 16-18) waist 30-32, hips 40-42care instructions: hand wash cold with gentle detergent. Do not soak or dryclean. I specialize in custom figure skatewear and ice dance dresses. These pants cannot be reproduced without express, written approval and authorization.